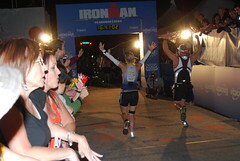 Good luck on the Ironman! you have some good gear and tunes. Thanks and thanks for the read! We are hitting Vegas on our way back! So did you get the tattoo? Also- I noticed in your pics that you wear different sunglasses while cycling and running? How come? I just got a pair of sporty glasses and I wear them for both cycle and run, and I don’t see what another pair could offer. Enlighten me! Tattoo is scheduled for Monday!!! I wear bigger glasses when I ride to keep the wind out but since I don’t run as fast as I ride I wear different glasses because they can fog while running. Make sense? Because I think I just confused myself! But mostly I have glasses that match my helmet! Just started reading your blog recently, so this may be a question you’ve answered elsewhere, but what kind of equipment do you use to measure your stuff (like heartrate during one race) etc.? 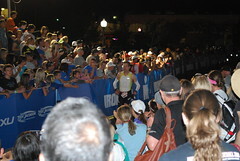 I use a Garmin 910XT for triathlon races. It is the best option out there. It integrates with my HR strap, my speed and cadence on the bike, and the footpod on my shoe. It also does amazing swim metrics in a pool and it is pretty good at open water. I upload my data to Garmin Connect , Strava, and Training Peaks (for my coach). It can be kind of overwhelming sometimes! How much is it for something like that? I’m on a bit of a limited budget. It would be interesting to see stats about how I am doing and how I’m improving! $400-$500 (US dollars; you are in the UK right?) I think. It isn’t a cheap option but it does everything a Triathlete needs! how are you enjoying the powermeter? It is a very useful tool for training and racing. Totally worth it! Only issue I have is not with the power meter but is with the Garmin 920. It drops the signal from the power meter and I am convince it happens mostly when I am wearing the watch. Somehow that blocks the signal. I hear ya, I tried the powermeter on my newest watch and also on edge, I did have a slight drop with my watch but it came back quickly. I will test it out again before i put my bike on the trainer for the winter again.